142. Movement used for varying the length of the traversing guide-bar which, in silk machinery, guides the silk on to spools or bobbins. The spur-gear, turning freely on its center, is carried round by the larger circular disk, which turns on a fixed central stud, which has a pinion fast on its end. Upon the spur-gear is bolted a small crank, to which is jointed a connecting-rod attached to traversing guide-bar. 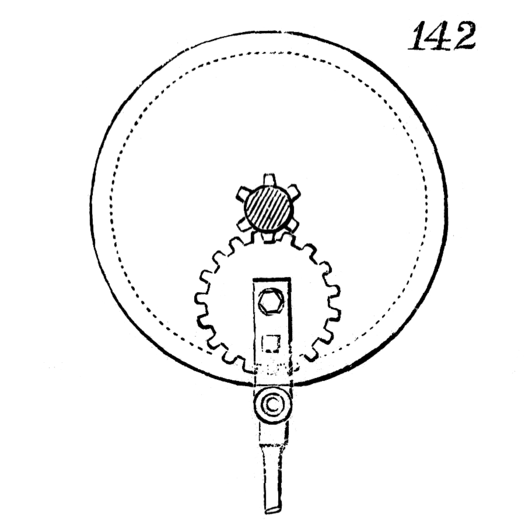 On turning the disk, the spur-gear is made to rotate partly upon its center by means of the fixed pinion, and consequently brings crank nearer to center of disk. If the rotation of disk was continued, the spur-gear would make an entire revolution. During half a revolution the traverse would have been shortened a certain amount at every revolution of disk, according to the size of spur-gear; and during the other half it would have gradually lengthened in the same ratio.